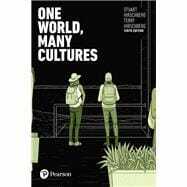 The Tenth Edition of One World, Many Cultures is a global, contemporary reader whose international and multicultural selections offer a new direction for freshman composition courses. In eight thematic chapters consisting of readings by internationally recognized writers from 24 countries, the text explores cultural differences and displacement in relation to race, class, gender, region, and nation. One World, Many Cultures also reflects the emphasis on cultural studies and argumentation that has become an integral part of many college programs. Featuring compelling and provocative writings by authors from the Caribbean, Africa, Asia, Europe, and Latin America, the text’s 52 nonfiction selections--including essays and autobiographies, one short story, and the questions that follow each selection--encourage readers to perceive the relationship between a wide range of experiences in different cultures and the corresponding experiences of writers within the United States. The Tenth Edition continues to provide a rich sampling of accounts by authentic voices, with 18 new readings and an all-new chapter on the forces that shape gender roles and the experiences of those who have overcome cultural barriers. Stuart Hirschberg is an Associate Professor in the Department of English at Rutgers: The State University of New Jersey, Newark. He has written scholarly works on Yeats and on Ted Hughes, and with co-author Terry Hirschberg, has authored eleven college textbooks. His research interests include cross-cultural and multicultural studies, visual rhetoric, and popular culture. Terry Hirschberg has written eleven college textbooks with Stuart Hirschberg in the field of rhetoric and composition.